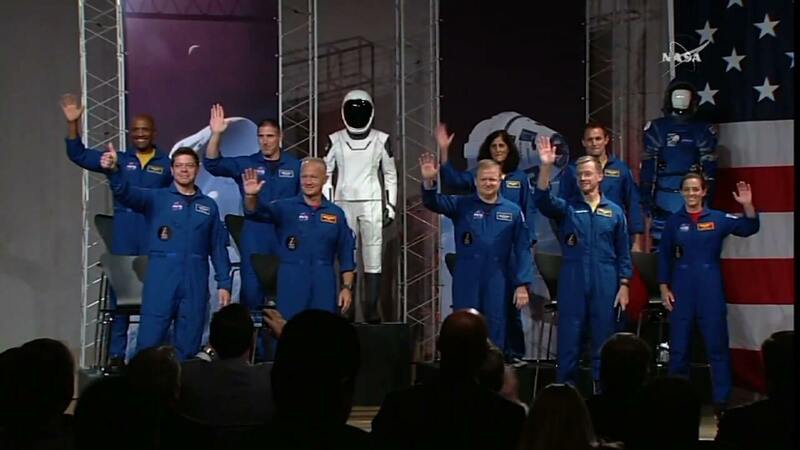 Home » Trump Hails Astronauts That Will Fly on SpaceX and Boeing Spaceships. And Space Force, Too? HOUSTON — President Donald Trump fired off a celebratory tweet yesterday (Aug. 3) to laud NASA’s first astronaut crews to fly on private spacecraft built by Boeing and SpaceX, a message that also appeared to hail the president’s proposed military Space Force. Trump’s Twitter praise for the astronauts did appear to gloss over the fact that NASA is actually paying SpaceX and Boeing to fly American astronauts. The tweet’s second sentence seems to suggest that Boeing and SpaceX are paying the government to fly the missions. In fact, NASA is paying Boeing and SpaceX billions to fly Americans to and from the International Space Station. It is true, however, that SpaceX and Boeing are paying to use some facilities owned by NASA and the U.S. Air Force. SpaceX has leased NASA’s historic Launch Pad 39A at the Kennedy Space Center (KSC) in Cape Canaveral, Florida to launch Falcon 9 and Falcon Heavy rockets. The company also uses launchpads at the nearby Cape Canaveral Air Force Station (CCAFS) and Vandenberg Air Force Station in California. Boeing has leased two of NASA’s old space shuttle hangars at KSC, known as Orbiter Processing Facilities, to build its Starliners and house two small robotic X-37B space planes it built for the Air Force. Boeing is also part of the United Launch Alliance (along with Lockheed Martin), a launch services company that uses launchpads at both CCAFS and Vandenberg. Trump’s statement that NASA is making a “BIG comeback” under his administration could be referring to the three Space Policy Directives Trump has issued over the last six months. In December, Trump signed Space Policy Directive 1 to set the moon as NASA’s next goal for astronauts. His Space Policy Directive 2, signed in May, was aimed at streamlining regulations for commercial space industry. In June, Trump signed Space Policy Directive 3, directing the Commerce Department to take charge of space traffic control operations. Trump’s congratulatory tweet ends with an emphatic “Space Force!” signoff, referring to the new space-centered branch of the military he has ordered the Pentagon to create. While some NASA astronauts are military officers, NASA itself is a civilian space exploration agency. In June, Trump directed the Department of Defense to form a Space Force as the sixth branch of the U.S. military. Boeing’s first crewed Starliner test flight will be flown by NASA astronauts Eric Boe and Nicole Aunapu Mann and Boeing astronaut Chris Ferguson in mid-2019. Ferguson, a former NASA astronaut and space shuttle commander, is Boeing’s director of crew and mission systems. SpaceX’s first crewed test flight on the Crew Dragon will be flown by astronauts Bob Behnken and Doug Hurley in April 2019. Trump wasn’t the only one heralding NASA’s commercial crew announcement yesterday. Vice President Mike Pence, who leads the National Space Council that has helped shape the Trump administration’s space policies, also weighed in. “Congrats to the first Americans who will travel on American rockets from American soil to the @Space_Station since 2011 aboard the @SpaceX #Dragon and @Boeing #Starliner,” Pence wrote.